The Get Started sheet contains basic instructions on how to use the tool, a key to each cell’s color and its purpose, and two important data input sections. Within these two sections, we’ll collect data about your overhead for things like office rent, software, etc and you’ll also be able to set the average wage levels of your workers. The reason we used wage levels within the Recurring Clients sheet instead of individual rates is because average wages fluctuate from month-to-month and this allows us to calculate wage/overhead increases/decreases (like insurance hikes) over multiple clients all at the same time. If you perform regular, month-to-month work for your clients with services like SEO, this sheet will become your best friend. It will allow you to calculate each of your client’s average monthly profit while also discovering which of your clients drain you each month and which ones you should and can afford to give more love to. Unlike the next two sheets, the Recurring Clients sheet is a monthly average of revenue and expenses. This is because, Recurring Clients will almost always pay the same monthly while specific hard costs and hours you spend working on the client’s account often fluctuate. So, when putting in your data in the blue cells, just use average costs, hours, etc. Also, because this sheet is based on averages, it will calculate differently on The Bottom Line sheet and you’ll only be able to see current month & year P&L. If you need more information about what each cell does, simply mouse over the white cells in row 1 to view the notes. The sheet will also calculate if you earn any combination of the three. For example, if you are paid a flate-rate management fee of $10,000 plus you receive a 2% commission for $1 million in client revenue ($20,000), the sheet will automatically calculate a gross revenue of $30,000. Most often, your client’s spend will vary month-to-month and so will your fee, but in some instances, you may have arranged a set spend and fee with your client each month. For those situations, you can select “On-Going” instead of assigning a month and year to the account. If you select “On-Going” you’ll be unable calculate P&L in The Bottom Line for a custom date range, but the P&L is included in the current month & year’s numbers. Essentially, the “On-Going” option just makes clients within the PPC Clients sheet function like Recurring Clients. Getting paid on one-time projects can be extremely simple… you quote the client a fee, the client pays you up-front. You’ll need to start with the total expected gross revenue from the project — usually, this is the number you quoted your client. If you are billing your client hourly and have yet to give them a final quote, you’ll need to put in the total gross revenue AFTER all hours are completed as the calculator doesn’t yet include a running billable hours function… yet. There are two blue cell sections within this sheet separated by an orange line. The section on the left is for the “actual” hours and expenses you’ve already incurred and the section on the right is for the overall “projected” hours and expenses. This will allow our sheet to give you an estimated net profit and margin and to also calculate the Outstanding P&L in The Bottom Line. After inputting all that data in the other 4 sheets, The Bottom Line will present your agency’s overall P&L in two easy ways. 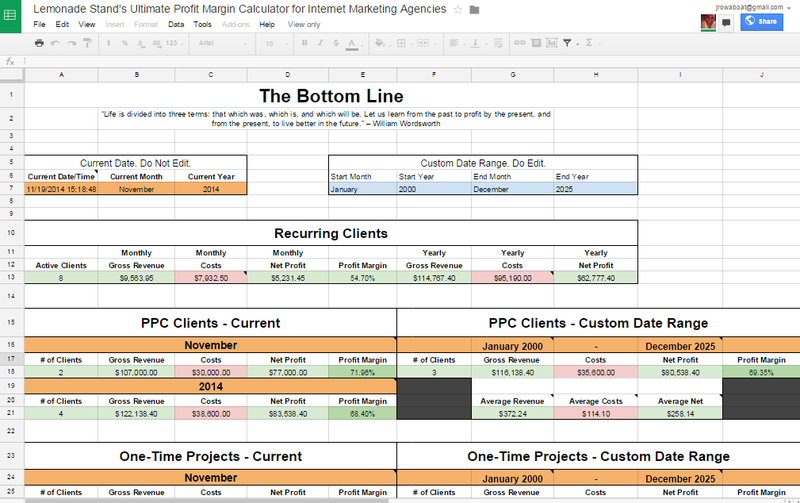 The top half of the sheet will be the current month and year’s profit, loss, and margin. This will include all active Recurring Clients, all on-going PPC Clients, all PPC Clients that returned a profit or loss during the current month, and all one-time projects that returned a profit or loss during the current month. The bottom half of the sheet will be similar to the top half except it will allow you to set a custom date range that calculates the profit, loss, and margin during any given period. The limitations with setting a custom date range is that it will not include any Recurring Clients or on-going PPC Clients P&L. This is because both are used for the purpose of calculating the current month’s profit only and not profit for any one specific time frame. This sheet is simply used for calculating P&L in The Bottom Line and you can ignore it completely unless you’re a spreadsheet nerd and want to go nuts with up to 25 years of raw, month-to-month data. Please don’t delete this sheet, or any sheet for that matter, as the calculator will not function correctly. Well, that’s it. I truly hope this calculator will contribute to you or your agency becoming even just a tad bit more efficient. We’re firm believers, here at Lemonade Stand, in “You can’t manage what you can’t measure,” and it’s my goal that this tool will help you measure the individual impact of each of your clients and the overall growth of your book of business.